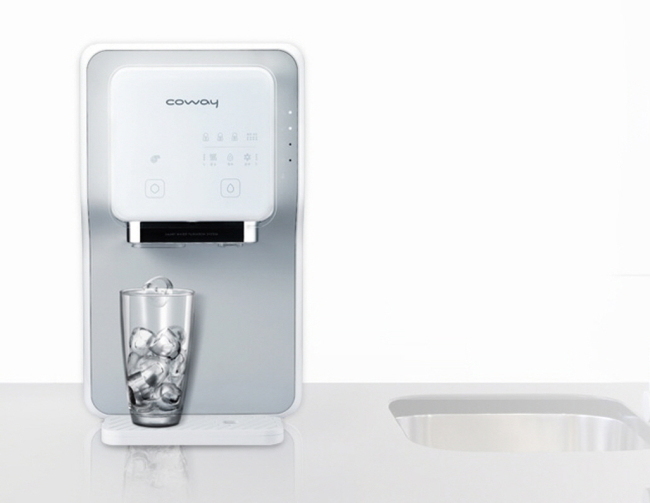 [THE INVESTOR] Coway, Korea’s top water purifier rental service firm, is facing setbacks in its search for a new owner as its stock price continues to fall amid concerns about its products containing toxic chemicals. The share price closed at 90,100 won (US$78) on July 20, which compares to 107,500 won on July 1 before nickel was detected in some of its products. Fueling public anger, the company was found to have hid the fact over the past year without informing customers. The company apologized publicly, pledging to suspend production and offer compensation to customers. Coway’s ice water purifier. Nickel was detected in water from some of its products. Hyundai Securities predicted the recent nickel scandal could cost Coway some 100 billion won to replace the affected products, lowering the target price from the previous 110,000 won to 105,000 won. “Considering the additional costs, it is unavoidable to adjust its earnings outlook this year,” said Kang Jae-seong, analyst at Hyundai. Last year, its largest shareholder MBK Partners sought to sell off the company but failed to do so possibly due to the hefty price estimated at more than 3 trillion won. "Currently, we have no plan to sell Coway," a PR official said on July 21. The nation’s biggest private equity firm purchased a 30.9 percent stake in Coway from Woongjin in 2013 for 1.19 trillion won or 50,000 won per share. Even though water purifier rental service is considered a lucrative business amid increasing safety concerns, potential bidders have complained the price is too high. More recently, Coway's smaller rival Tongyang Magic has been put for sale at a lot cheaper price of 500 billion won, with China’s Haier and Korea’s CJ and Cuckoo surfacing as likely bidders.